The last couple of weeks have seen Curiosity return to the business of making steady headway toward Murray Buttes and, beyond them, Mount Sharp. Eight of the last 14 sols have seen drives ranging in length from 30 to 104 meters, racking up a total of more than half a kilometer. Woo hoo! How far do they have to go, and when will they arrive? Let's look at a map to try to answer these questions. I'm now tracking Curiosity's progress on a new base map combining crisp Mars Reconnaissance Orbiter CTX camera data with the subtly shaded color of Mars Express HRSC. 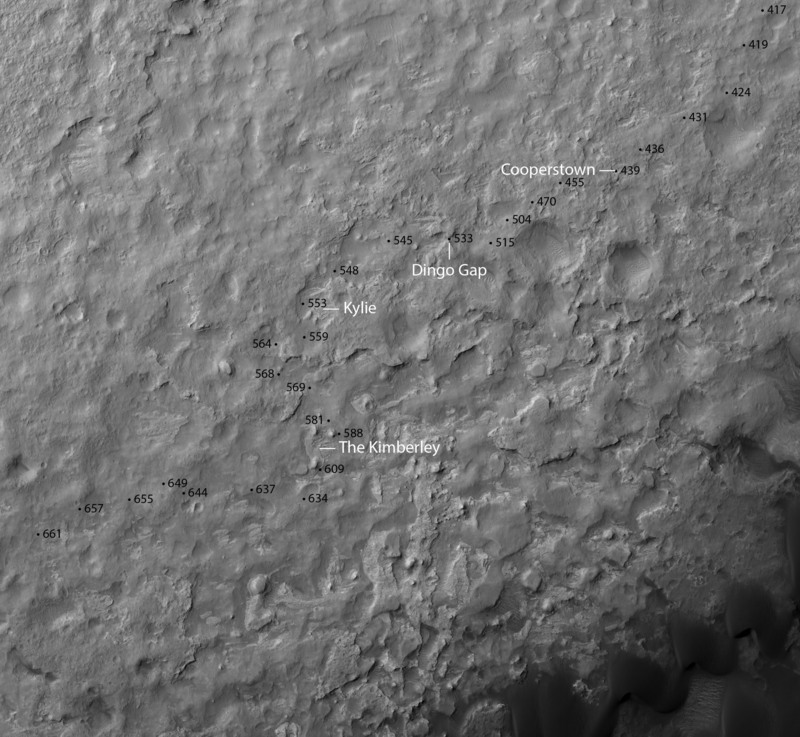 The straight-line distance between Curiosity's current position and the northern edge of Murray Buttes is about 3.5 kilometers. Of course Curiosity can't drive in a straight line, especially now that the rover drivers have learned that they need to stick to sand-filled swales in order to prevent damage to the wheels. So let's call the drive distance 5 kilometers. If they can return to the rapid drive rate they enjoyed in the 5 kilometers between Yellowknife Bay and Kylie, they should be able to cover 5 kilometers in about 8 months. They accomplished some stretches of that drive even faster; at the rate they drove the 3.3 kilometers between Mount Wilson and Cooperstown, they could get to Murray Buttes in under 5 months. 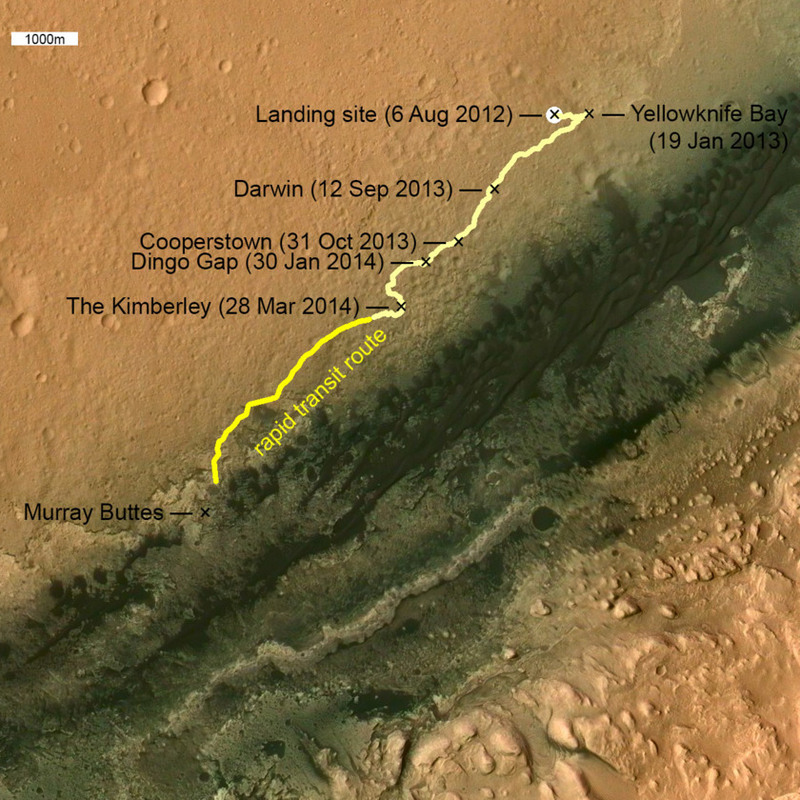 Either way, the second anniversary of the landing in August will see them still trundling toward the destination, and (assuming things go well) they'll arrive at Murray Buttes toward the end of 2014 or in the first few months of 2015. In order to rack up the meters, Curiosity is not stopping to smell the roses. But she can do quite a lot with remote sensing. On the way away from the Kimberley, on sol 631, Curiosity took a moment to capture a detailed Mastcam-100 panorama of a rocky outcrop to the southeast of the Kimberley. This outcrop contained some of the strangest-looking rocks I've seen. My favorite is this thing poking out of the ground that looks for all the world like dragon skin. 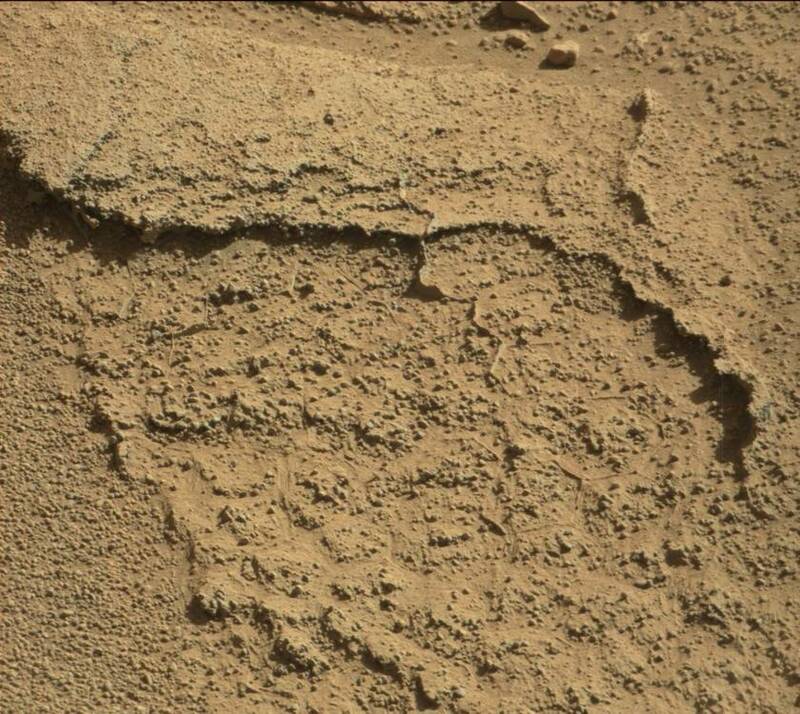 I think that what we are seeing here is a very thin layer of rock that has polygonal cracks, viewed in a foreshortened way that makes the polygons appear to overlap. But it's definitely weird. Here's the full panorama in all its glory. After driving southeast from the "Windjana" drill site at the Kimberley, Curiosity took this Mastcam-100 panorama of an outcrop of thinly bedded rocks. Wind has sculpted the layers into thin fins and other fantastical shapes. After this outcrop, Curiosity took a last look at the southern end of the Kimberley on sol 632. She shot this intriguing-looking rock a few times with the Chemcam. Again, there are polygonal features, but here it looks like the material filling the cracks between the polygons is sticking up, rather than absent as it was in the "Dragon Skin". Mars weathering is weird. Then Curiosity drove off. She passed by and imaged a pile of tumbled rocks that they called Wesley Yard on sol 635. 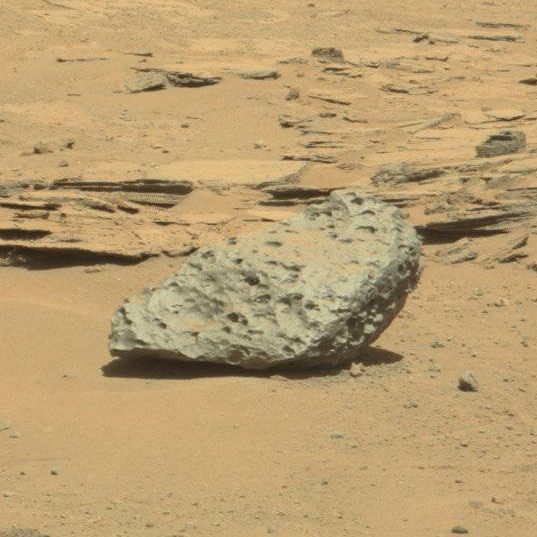 Then, on sol 636, she spotted a couple of interesting big rocks in the distance. Actually, that's not quite accurate; both rocks are visible from orbit, so they were first spotted by HiRISE. Here is one of them, named Littleton, imaged by Curiosity on sol 637. (They also took a lot of ChemCam photos of it on the same sol.) This is most likely a meteorite; it looks a lot like the meteorites that Opportunity has studied. They followed with some long-distance imaging of the sand ripples atop the dunes near the base of Mount Sharp on sol 639, and then Curiosity drove quite close to the other meteorite, Lebanon, taking multispectral images and ChemCam data on sol 640. Here it is in slightly enhanced color. 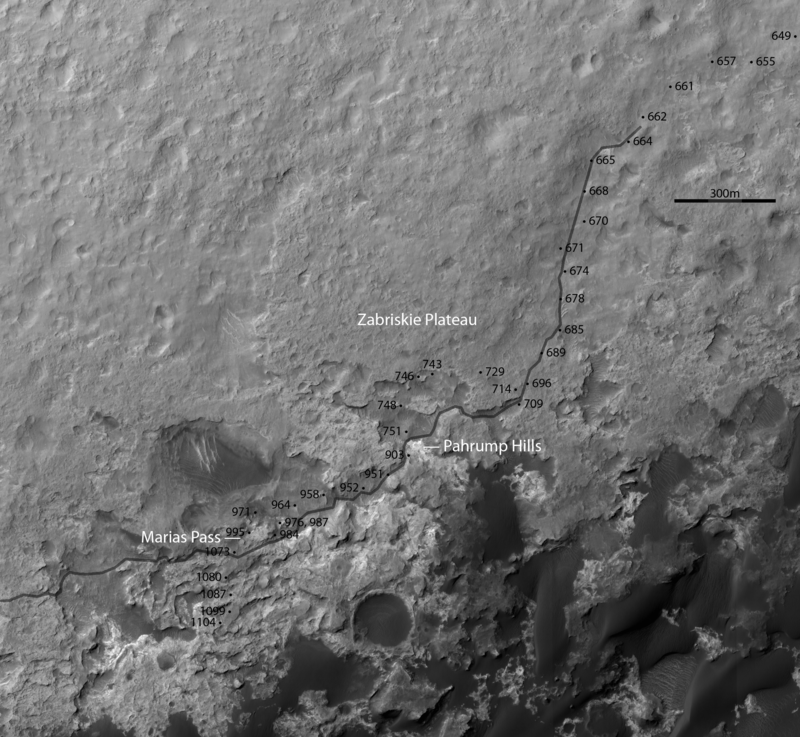 But she left the meteorites behind on sol 641, and drove again on 643 and 644. I'm only slightly sad they didn't check out the meteorite more closely. 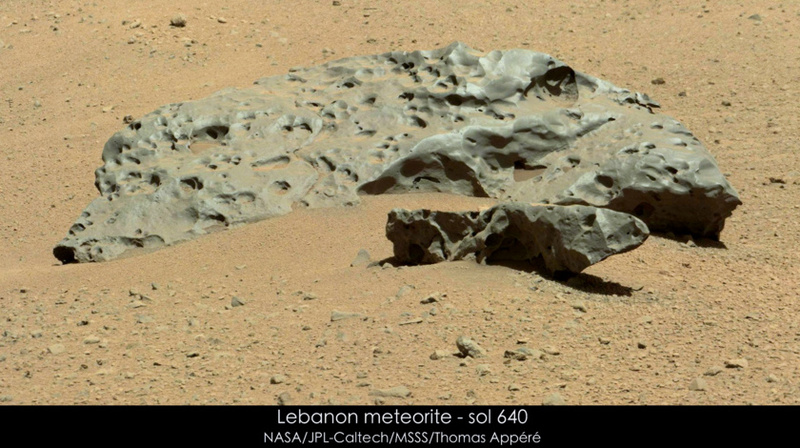 Neither Curiosity's drill nor its SAM or Chemin instruments can do anything with an iron meteorite. Curiosity needs to drive to places where she can use those unique instruments, and she's got 5 kilometers of driving yet to go before she gets to Murray Buttes. Best to stick to the road. The rover is getting close to the edge of this map, so here is what the next section of the 3D map will look like. 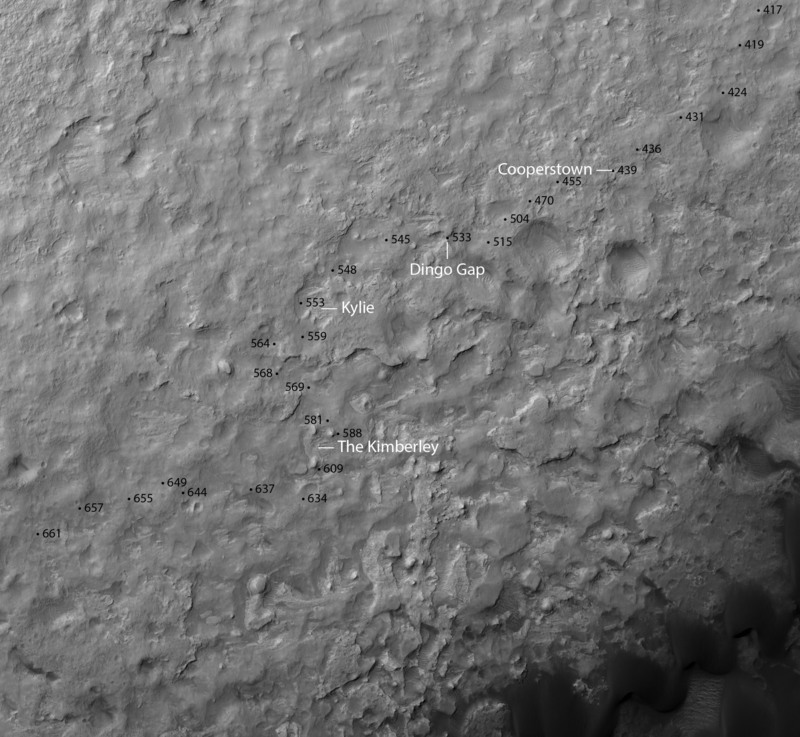 Because I'll be updating this map with Curiosity's traverse, if you're reading this in the future you'll (hopefully) see Curiosity's track entering it. I have to say that the terrain starts to look quite a bit dicier in this last section running toward Murray Buttes. There begins to be a kind of plateau-and-basin sort of terrain, with highstanding scabby areas bordered by steep dropoffs that fall into sandy lows. The views would be cool from within those lows, but I'm not sure about navigating around the steeper bits. The terrain looks a little less scary to the north. But also a lot less interesting. I'll be curious to see what course Curiosity eventually takes through here. Here is some detail about drive planning for true rover geeks. I asked Ashwin Vasavada about the recent rapid driving and he explained to me that they're tweaking the planning schedule in order to squeeze in more driving sols, something that they actually did earlier this year during the fast part of their traverse toward the Kimberley. Planning Mars landed missions is complicated because of the slight mismatch between day length on Mars and Earth. When they first land, Mars missions operate on Mars time, in which they ignore Earth time and just do all the planning work over the rover's night, whenever that happens to be on Earth. But these schedules are absolute misery to follow, so Curiosity is now on Earth time (and has been for most of the mission). It ordinarily takes an 11-Earth-hour workday to plan one Curiosity sol. During the usual course of operations, the Curiosity mission allows this 11-hour day to drift against the Earth clock and align with the Mars clock to some extent, but there are limits. The planning day is not allowed to begin earlier than 6:00 a.m. Pasadena time, and it can't end later than 11:00 p.m. Mars and Earth schedules sync up once about every five weeks -- 37 Earth days pass for every 36 Mars sols. For a while, California days more or less overlap with Gale crater nights, so they can plan drive sols every day. But eventually Mars and Earth schedules get out of sync and they don't get the data from Mars that they need to understand the rover's current position and environment in time to actually plan a drive that day. When the schedules are out of sync like that, they can only plan drives every other day, a condition called "restricted sols." Unrestricted and restricted sol periods alternate, each period lasting two or three weeks. What they're doing now is working occasionally with a shortened planning timeline that takes only 7 hours instead of the usual 11. They still have the same limits to their workdays -- no work earlier than 6 a.m. or later than 11 p.m. -- but the short schedule allows them to finish earlier or start later if they need to. That allows them to run a few extra sols of planning in unrestricted sols on each end of the cycle, giving them a few extra days in which they can drive, and shortening the period of restricted sols to just a bit more than a week. There's a cost: with few hours in the planning day, they can't perform activities that are complicated to plan. So you won't see fancy mosaics, or arm work, or targeted ChemCam observations. Instead, Ashwin explained, they work with "templated" science activities that are the same for every drive sol, so the only planning the drivers have to do each sol is to drive as far as possible, then they can turn the crank on the templated science. There's actually quite a lot of science in these repetitive, templated activities, most of which take place after the end of a drive. They take a MAHLI photo from the arm's stowed position, which gives them a regional survey of the landscape. They take a MARDI image, looking down at the ground, which gives them a survey of the shapes and sizes of rocks and soil particles beneath the rover. They do a DAN active observation, pinging the ground with neutrons to measure how much hydrogen lurks beneath the surface. They take a set of photos with Mastcam pointed down at the ground, to survey how soils change along the traverse. They take a full Navcam panorama. 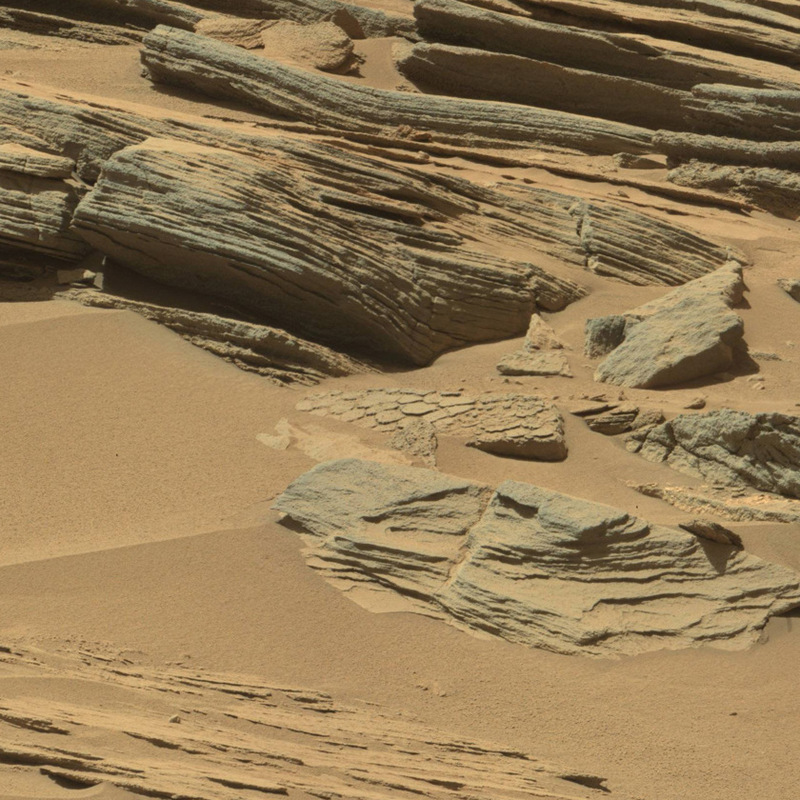 And they usually take a Mastcam panorama in the drive direction, to plan drives. All in all it's quite a lot of data that's potentially useful for science, even in a time when they're restricting their science planning. This shortened planning timeline is only needed for a few sols that fall at the transition between restricted and unrestricted sols. This week, they did it for two planning days. They'll do it for a couple more days after the period of restricted sols is over. For the rest of the 37-Earth-day cycle, they use the full 11-hour planning schedule, whether they're in restricted or unrestricted sols. The short planning timeline, used just a few times a cycle, buys them a few more drive sols each cycle at the expense of a little bit of specific science, all to reach Mount Sharp as fast as possible. Martian weathering of the rocks in your 'fractured rock' panorama photo are truly fantastic. I'm guessing these shapes are the result of relentless wind sculpting over many millions of years. There appear to be a variety of shapes in the area. Are these the result of very different rock material being shaped by the wind or the same rock material being shaped by a variety of wind forces?, i.e. wind speeds or wind angles...thanks! Emily, thanks for another thoughtful and wonderfully engaging post. You are the web's best source for updates on Curiosity! Looking at your last stereo image, it looks like there may be very light colored deposits to the south, under the darker materials Curiosity now sits on. Near the lower left corner, they even look layered. What's the current thinking? Are they lakebed deposits? Salts? I can't imagine such polygonal patterns - the 'dragon skin' as well as the raised-relief example apparently eroded in a way that preserved more resistant material that might have filled the cracks before the 'plates' had eroded away - could be the consequence of anything other than repeated and very frequent episodes standing water interspersed by drying episodes. Their context within a plethora of finely stratified layering (quite consistent with episodic sedimentation) revealed by erosive dissection certainly doesn't look like the result of any lava flow. I am not aware of any igneous rock melt mixture recipe that is consistent with the very low viscosity evident in these exposures. This spectacular landscape MUST have been fostered by water - and LOTS of it. How large are the polygons? Normally a Brunton compass is laid on the rock for scale. I suppose they forgot to take one to Mars. @Piso, it does look like Curiosity left her Brunton behind at JPL :) Joking aside, it is very important to figure out rock layer strike and dip. They do that by taking stereo images, often from a long baseline (driving the rover in between shots) and doing image analysis to figure out how the layers are sloping.